SANTA BARBARA, Calif. - May 22, 2018 - PRLog -- Edited by Silver Webb, Laura Hemenway, and Ron Alexander, The Santa Barbara Literary Journal is a new biannual publication that will be available on Amazon in both print and kindle format and was inspired by and birthed from the 2017 Santa Barbara Writers Conference which will celebrate its 46th year on the beach in Santa Barbara from June 17th - 22nd. The brainchild of Editrix Silver Webb, the journal features works from conference alumni Yvette Keller, Matt Pallamary, Stuart Orenstein, Janet Rendall, Max Talley, Reina Warnert, Silver Webb, Lisa Lamb, and Sacha Wamsteker. A number of other talented artists, writers, and musicians are also contributors along with cover art from a painting titled "Making Tomato Paste" by Mary Freericks. In this abridged letter from the opening of the journal, editor Silver Webb says, "Who is to say what is literary? In my mind, if it is a story and it is well-written, it's literature. But I find that stories considered genre are often deemed to be a different universe than literary fiction. Just as song lyrics are considered less-than poetry. Is it possible to have a literary werewolf? Would he have to wear a tuxedo and enunciate like Lord Mountbatten before he is considered literary? Can a witch be literary? Only if she goes to Harvard? (Believe me, I've befriended more than one unusual creature with a Ph.D. from that place.) I dislike the idea that literary fiction really means boring fiction, and that it is somehow valued more than anything with a teaspoon of imagination to it. That was partially the steam in this punk editor's engines when I decided to start SB Lit Jo. I was actually at the Santa Barbara Writer's Conference in June 2017, at an early morning writing group. Meeting so many talented writers at that conference and listening to them talk about the difficulty in getting published, the idea for the Santa Barbara Literary Journal rolled into orbit. And the first volume, which contains a few meteorite shards from that early morning writing group, is named 'Andromeda.' It's my sincere wish that you enjoy every unique contribution to this journal." 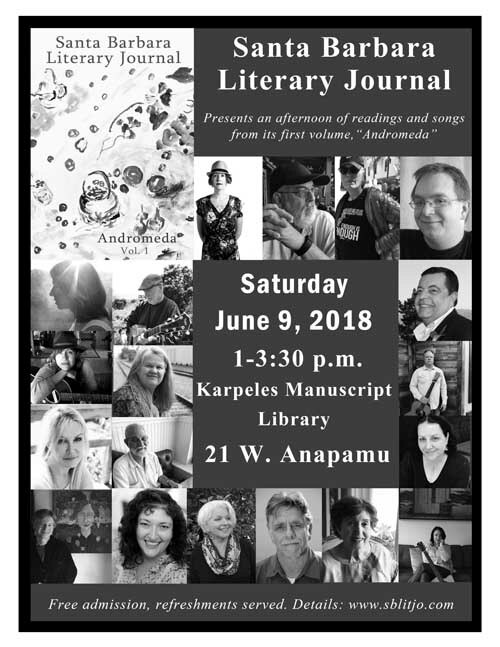 A secondary journal reading event will be hosted by the SB Writer's Night from 7-9 p.m. on Tuesday June 12that the Oreana Winery on 205 Anacapa Street in Santa Barbara. The Santa Barbara Literary Journal accepts submissions of short stories, flash fiction, poetry, memoir, plays, and song lyrics. Works of Science-Fiction and Fantasy are particularly welcomed. The journal aims to build community among the many creatives in Santa Barbara, although writers from any location are free to submit their work. Interviews of the contributors and news about the journal can be found at www.sblitjo.com. What Really Happens When Someone Drinks Alcohol To The Point Of Blacking Out?